Photography is a medium well-suited to recording and imagining the world. It is a cipher for knowledge and a precise yet malleable cataloguing system that can be used to make sense of things that are not readily identifiable. And it can be terrifyingly particular in its results. Something beautiful and disquieting happens when David Maisel trains his camera on unfamiliar tracts of land that have been radically reshaped by mechanized activity and environmental neglect. The stains and detritus of mining, logging, and other similarly invasive industrial processes have been an inextricable part of the American landscape for almost two centuries. Although at ground level we may barely notice this topography of open wounds, the view from above is altogether a different matter. This has been Maisel’s principal photographic subject for almost three decades. His quest has taken him up into the air and toward the boundaries of the unknown to unveil a world that most of us have not seen before. The seven distinct aerial photography projects assembled in this volume present a medley of terrains transformed by humankind to serve its needs and desires. Maisel has charted an array of American environments—from open-pit mines and power plants to military installations, hazardous waste sites, and the post-apocalyptic megalopolis that is Los Angeles. The photographs do not tell a happy story. They make it clear that as long as minerals are valuable and public land accessible, mining companies will continue to scar the landscape. There will always be a tension in nature between growth and destruction, but will agencies as prominent as the US Department of Agriculture continue to regard trees as simply a cash crop rather than a natural resource to be valued and protected? On the one hand Maisel’s photographs are statements of fact, yet they also function as a system of ideas as well as a ravishing feast for the eyes. But we cannot get from these images a complete picture of what happens (or has happened) at these sites. There is a hint of the slippery and the miraculous about them. In Black Maps, Maisel’s photographs create rich meaning and portents through severances. Repeatedly the photograph’s bounding frame formulates space by limiting it, simultaneously lavishing the imagination with a sense of vision beyond what is shown. What we are left with are complex visual shards that pulse with life and embody the photographer’s concentrated thoughts and emotions. In the composition, the artist does exactly what every eye must do with life, fix the particular with the universality of his own personality—Taught by the largeness of his imagination to feel every form which he sees moving within himself, he must prove the truth of this by expression. Maisel makes photographs to find novel ways to perceive the world and, picture by picture, project by project, constructs a worldview through his consistent, active exercise of the imagination. He recognizes that we experience reality with a piecemeal understanding but that we can frame and compose parts of the world in an attempt to gain some coherence and control over it. This is not a dry, philosophical activity but a passionate engagement with the photographic medium as the vehicle for finding order and meaning in the world. The vital thread that runs through Black Maps is Maisel’s tireless search for new and ever-shifting ways of conveying, photographically, the scope of humankind’s uneasy and conflicted relationship with nature. While the photographs are unstintingly particular in what they describe, Maisel has consistently avoided narrowly defining his work in political terms. He has kept a polite distance from the agendas of politicians and environmental activists. Unsettling and even alarming at times, Maisel’s photographs do not assign any blame, but they do take on a moral significance almost by default. Many factors have drawn the photographer to a specific landscape, among them its vastness, its coloration and palette, its formal complexity, or its sense of paradox. Inspired by the writings and earthworks of Robert Smithson, Maisel’s bold ambition has been no less than to change our relationship to the landscape and our understanding of its “history” and in so doing provide a singularly aesthetic appreciation of the apocalyptic sublime. The second angel blew his trumpet, and something like a great mountain, burning with fire, was thrown into the sea; and a third of the sea became blood, a third of the living creatures in the sea died, and a third of the ships were destroyed . . . and many men died of the water, because it was made bitter . . . woe, woe, woe to those who dwell on the earth. David Maisel grew up in a typical middle-class neighborhood in Long Island, New York. Every house on the street looked the same. He attended the local public schools, and he has a profound boyhood memory from 1969 of Lake Erie catching fire from the pollution generated by the heavy industry along its shores.3 That summer, Cleveland’s Cuyahoga River erupted into flames, and several of its tributary streams, which empty into Lake Erie, also burned. Maisel watched television coverage of these events, and their apocalyptic aspect had a lasting effect on his imagination. He understood the moral transgression of thousands of gallons of untreated waste, including nitrates and phosphates, leaching into the ecosystem and killing off marine life and flora. This vision and its implications refueled itself over time, but not until his years as an undergraduate art student at Princeton University did Maisel encounter the aesthetics of the sublime as codified by the eighteenth-century British philosopher and writer Edmund Burke. In his 1756 Philosophical Enquiry into the Origin of Our Ideas of the Sublime and the Beautiful, Burke claimed that the sheer vastness of nature could inspire both awe and terror. His formulation proposed that the sublime and beautiful were perceived in emotional as much as intellectual terms: “Whatever is in any sort terrible, or is conversant about terrible objects, or operates in a manner analogous to terror, is a source of the sublime; that is, it is productive of the strongest emotion which the mind is capable of feeling.” 4 In 1983, after his sophomore year at Princeton, Maisel traveled to Mount St. Helens, Washington, with his professor Emmet Gowin, who three years earlier had received a fellowship from the Seattle Arts Commission to photograph the aftermath of the May 1980 eruption of the volcano.5 Gowin was transfixed by the landscape after his initial visit and photographed it in a sustained way over several years.6 During the summer of 1983, he invited Maisel to accompany him. The weeklong trip included several Cessna airplane rides circling the rim, ashen crater, and lava dome at the summit of Mount St. Helens. Maisel recalls the experience as a marvelous awakening of possibility. He was able to view the landscape from above like a “disembodied eye,” banking right and left in the aircraft and sweeping down inside the walls of the volcano to see the innards of the earth in a way that would never have been possible from the ground.7 For the first time he witnessed the damaging environmental consequences of commercial logging from the air, and he was able to observe patterns of land usage that had eluded him from below. He found that an aerial perspective’s abstracted and distanced view of the earth allowed for the framing of relationships between landscape features, and a new set of picture-making possibilities was born. Reflecting on this formative trip a year later, Maisel remarked: “There, in the wake of the volcano’s destruction, I learned that my most vigorous response as an artist was to a landscape of extremes. The environment had been transformed as well by the formidable activity of the logging industry. Witnessing the altering effects that securing natural resources had on the land led me to photograph quarries and strip mines.”8 While the vocabulary of environmentalism is alive in Maisel’s statement, its more compelling aspects are the photographer’s openness to the possibilities of the industrial sublime and his definition of himself as an “artist.” Maisel made just a handful of pictures from the air during this first trip to Mount St. Helens, using a six-by-seven-centimeter Plaubel Makina camera. The majority of his effort was spent on the ground working with a tripod-mounted four-by-five-inch camera, methodically mapping the landscape. While Maisel gained much from his relationship with Gowin, as important at this juncture was the example of Edward Ranney, who taught him during his junior year at Princeton. Ranney supported Gowin’s abiding interest in architecture and the built environment, and his extensive documentation of Peruvian monuments and Native American archaeological sites throughout the American Southwest provided the young photographer with the exemplar that you understand society by what it leaves behind. contest between humankind and nature. Echoing the deceptively sophisticated desert landscapes of Frederick Sommer (whom he visited for the first time in Prescott, Arizona, two years later), Maisel eliminates any trace of a horizon line or sky and renders this lunar-like landscape of countless decimated trees, scattered like matchsticks, unimaginably engrossing. This is to my eye one of the most striking and baleful of Maisel’s early photographs, signaling his gift for discerning the sublime in a devastated terrain as well as his keen engagement with the disastrous environmental effects of clear-cutting, a subject that would be the focus of his later series in Maine, The Forest, 1986. From Frederick Sommer, Maisel learned how to look at the world dispassionately and to build complexity into pictures. A photograph does not simply describe or classify its subject. It can be the expression of an idea and function as a way of seeing that represents the world as a complex and ever-shifting universe of forms. The image can sometimes be obscure and difficult, but this challenges viewers to abandon their knowledge and enter an unknown world. In another 1983 work, Wall of Ash, Walking to the Crater, Mount St. Helens (see figure 3, page 13), Maisel seems to exercise the very act of seeing and calls into question what is considered worthy of examination in a photograph. He takes a more restrained, analytical view of the landscape, building the composition around a nondescript bank of accumulated ash and shale that slopes down into the foreground and accentuates the natural geological processes that have taken place here. Maisel takes full advantage of photography’s ability to eulogize what is there by preserving a trace of it. His photographs are permanent imprints of a time and place, of the once-was. They are the truths of unexplained remainders, and they convey time both thievishly and generously. But they are also as supple and symbolic as our own ever-shifting perceptions. By turns plucking an instant from the flow of instants and prolonging the duration of the visible well beyond the momentary, they describe and intimate timelessness. These characteristics find a vivid visual parallel in the expeditionary and archaeological photographs of desert landscapes in the Middle East by Maxime Du Camp and Francis Frith from the 1850s.10 Maisel’s mining photographs explicitly engage in landscape conventions that shuttle directly back to the mid-nineteenth century. Indeed, Maisel has been unequivocal that his work is an extension of the pioneering landscape photographers of that era. His affinity with that tradition is perhaps most thrillingly in evidence in the King Survey photographs of Timothy H. O’Sullivan.11 Maisel shares with O’Sullivan a drive to map the unknown and a passion for engaging with the contemporary landscape both as a physical reality and a technological artifact. 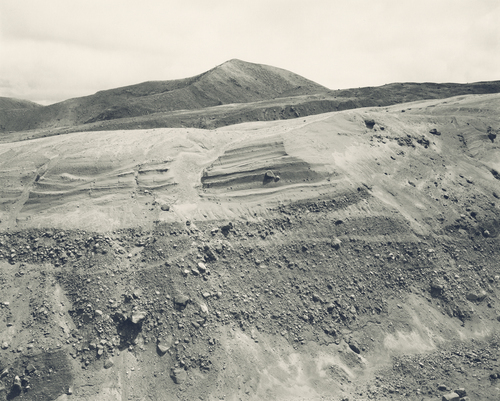 As a hired hand working for a public agency, O’Sullivan engaged in photography as a form of specimen collecting, but he also had a relatively free hand to decide what to select and how to frame his subjects.12 The evidence of his prodigious output suggests that he could judge what was worthy of recording, whether the subject was a geological feature—the genesis of a mountain range, for example—as in his 1867 study Volcanic Mud Hills near Humboldt Salt Marsh, Nevada (see figure 4, page 14), or an industrial site during the West’s mining boom, such as Sugar Loaf Mountain, near Virginia City, Nevada, 1868 (see figure 5, page 14). This desire to seek out features of the landscape that “correspond to the structure of human thought and feeling” is what propelled Maisel deeply into 1985’s Black Maps project. As represented in this publication, the series begins with an extensive investigation of Bingham Canyon (pages 17–21), a mining operation southeast of Salt Lake City, Utah, that boasts the deepest open-pit mine in the world, generating more than eighteen million tons of copper ore and ranking as one of the largest human-made excavations anywhere.16 Here Maisel was inspired by seeing firsthand a kind of industrial equivalent to the deeply cut, sculptural forms of Robert Smithson’s earthworks: “Smithson’s transformations of post-industrial wastelands led me to realize that our most vigorous response is to the landscape of extremes, where we are witness to the elements of nature laid bare.”17 Spurred on by his early successes in Arizona and New Mexico, Maisel pushed ahead and continued to organize flights over sites of interest, funding them through a combination of skillful networking, a few print sales, and the income from his Massachusetts teaching job.18 By 1989–90 Maisel had received an individual artist’s grant from the National Endowment for the Arts and put virtually all the stipend toward funding flights. At around the same time he shifted into color materials, which vitalized his pictorial vocabulary, introducing a new set of challenges and a dizzying palette of ravishing, almost hallucinogenic colors. In his splendid essay “Unrecoverable Spin” on the Terminal Mirage series (page 157), Joseph Thompson refers to the photographs as “inhabiting the space and conditions of a painted canvas, the world of Rothko, Diebenkorn, and Kiefer.” The reference to Richard Diebenkorn is especially apposite because the Oregon-born artist made a series of flights between Albuquerque and San Francisco in 1951 that had a transformative affect on his painting: “The aerial view showed me a rich variety of ways of treating a flat plane—like flattened mud or paint. Forms operating in shallow depth reveal a huge range of possibilities available to the painter.”19 Diebenkorn’s bold new approach to pictorial space can be seen in a series of approximately fifty-six paintings created between 1953 and 1955; these were made after the artist moved his family from Albuquerque to the San Francisco Bay Area.20 One of the earliest paintings in the series, Berkeley 3, 1953 (see figure 6, page 15), is suffused with interlocking and overlapping fields of luminous, atmospheric color. The subtle modulations of the sun-drenched earth tones make them appear to advance and recede, helping to create a sense of palpable three-dimensional space. With Maisel’s shift into color, the correspondence with abstract painting is unmistakable. Colors are often active protagonists in his compositions, or they are delicately integrated, as in American Mine (Carlin, Nevada 13), 2007 (page 211), where Maisel takes maximum advantage of the deep honey tones of the Nevada light and flattens the composition into a mesmeric combination of robin’s egg blue, gold, and earth tones. Produced in mural-size prints for exhibition, these photographs keenly demonstrate how Maisel readily understands photography’s characteristic as a medium that necessarily abstracts. He is also a technician of the highest caliber and keeps all the traditions of photography in play while savoring the fluidity that accompanies its constantly evolving technologies. The laws of nature are just, but terrible. There is no weak mercy in them. 1 Maisel particularly admires Wallace Stevens, and he considers The Necessary Angel: Essays on Reality and Imagination (New York: Random House, 1965), to be among the most important books in his library. 2 William Carlos Williams, Spring and All (New York: New Directions Books, 2011), 27. 3 David Maisel in conversation with the author, November 17, 2011. 4 Quoted in Francis D. Klingender, Art and the Industrial Revolution (London: N. Carrington, 1947), 74. 5 See Jock Reynolds et al., Emmet Gowin: Changing the Earth (New Haven and London: Yale University Press, 2002), 142. 6 The volcanic eruption of Mount St. Helens on May 18, 1980, radically reshaped the topography of the surrounding area and prompted many journalists and photographers to visit the area. Among the photographers were Frank Gohlke and Edward Burtynsky, both of whom made notable work. See Manufactured Landscapes: The Photographs of Edward Burtynsky (Ottawa and New Haven: National Gallery of Canada and Yale University Press, 2003), 15. 7 David Maisel in conversation with the author, October 6, 2011. 8 Statement by David Maisel for the exhibition Taking the Place of Mountains at the Bromfield Gallery, Boston, MA, 1984. Unpublished, David Maisel Archives. 10 See Julian Cox, “Reverie and Description: Maxime Du Camp, Francis Frith, and the Exploration of the Middle East,” in Imagining Paradise: The Richard and Ronay Menschel Library at George Eastman House (Rochester, NY, and Göttingen, Germany: George Eastman House and Steidl, 2007), 58–71. 11 See Keith F. Davis and Jane L. Aspinall, Timothy H. O’Sullivan: The King Survey Photographs (New Haven and London: Yale University Press, 2011). 13 There are several notebooks from the mid-1980s that trace the emergence of Maisel’s artistic identity. They contain drafts of letters, bibliographic references, and important technical information about his working procedures. For example, in 1984, during his final year at Princeton, Maisel took a flight from Stockton, New Jersey, across the Delaware River, and up to Pennsylvania, and he photographed with a two-and-a-half-inch Rolleiflex camera with 400 ASA film, an aperture set at 2.8 at an exposure of one-five-hundredth of a second. Unpublished, David Maisel Archives. 14 Letter from David Maisel to Frederick Sommer, June 14, 1985. Unpublished, David Maisel Archives. 15 Statement by David Maisel for the exhibition Taking the Place of Mountains at the Bromfield Gallery, Boston, MA, 1984. 16 See the website for Bingham Canyon, which is owned by the Kennecott Mining Company, www.kennecott.com. 17 David Maisel, Princeton undergraduate thesis exhibition statement (May 1984). Unpublished, David Maisel Archives. 18 David Maisel, email correspondence with the author, March 6, 2012. 19 Quoted in Gerald Nordland, Richard Diebenkorn (New York: Rizzoli, 1987), 43. See also Mark Lavatelli, “Richard Diebenkorn: The Albuquerque Years,” Artspace IV, no. 3 (June 1980): 20–25. 20 See Masterworks of American Painting at the de Young (San Francisco: Fine Arts Museums of San Francisco, 2005), 401–4. 21 Frederick Sommer, Words (Tucson: Center for Creative Photography, University of Arizona, 1984), “General Aesthetics” (1979), 26. 22 David Maisel, Princeton undergraduate thesis exhibition statement, May 1984. Unpublished, David Maisel Archives. 23 Quoted in Louise Bachelder, ed., Nature Thoughts (Mount Vernon, NY: Peter Pauper Press, 1965), 54.